“Both my parents families were from NY. After moving to Texas, my mom would tell us stories about how valiantly our ancestors opposed slavery, among them Harriet Beecher Stowe and Henry Ward Beecher, and how bad she believed segregation was. Harriet’s brother, Henry Ward Beecher, famous for his preaching, secretly aided the fight against slavery by sending rifles to the South in pine boxes marked “BEECHER’S BIBLES”. Mrs. Stowe was a friend of Hattie, the kindly wife of the plantation owner that Hattiesburg, Mississippi was named after. Hattie had many slaves. However, she held a reputation of being nicer to them than most slaveowners. 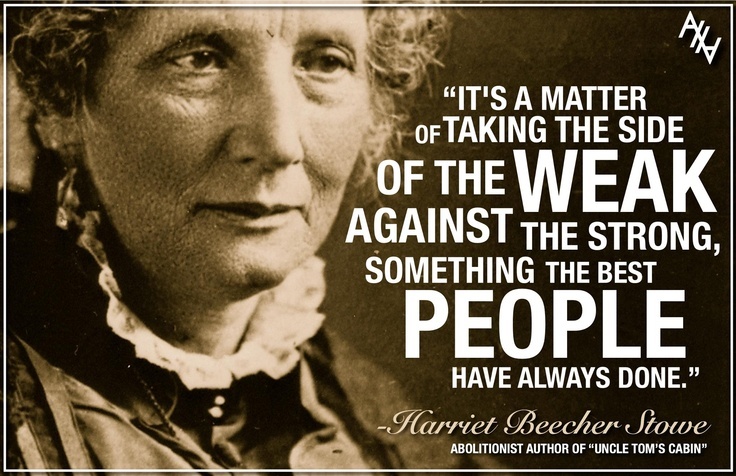 What could Harriet, a sworn abolitionist, and Hattie, a veteran slave owner, have in common? And could they possibly have been in cahoots? It was later revealed that Hattie’s home concealed hidden rooms, leading people to suspect her home may have been a stop along the Underground Railroad that carried runaway slaves to freedom in the North. Historic times to grow up in. Read how it inspired her to write her first book! 100% of every donation is used to create media for children’s character. We need to print up books for schools and teachers. Each book we donate to schools costs around $3 to print. Can you help? WE NEED YOUR MILK OF HUMAN KINDNESS! Read the Article here and get a digital download of Ruth’s art texbook for kids when you donate! This entry was posted in Character Development, Child Development, Children and tagged slavery. Bookmark the permalink.